Denna produkt ger dig 1106 bonuspoäng. 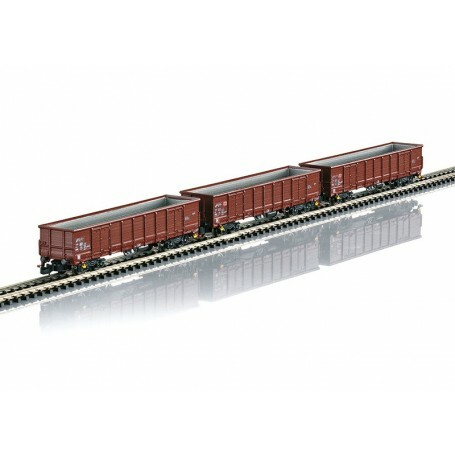 Vagnsset med 3 öppna godsvagnar Eanos-x 052 typ DB AG, totallängd över buffertar 252 mm, epok V.
Freight Car Set with 3 Cars	Model: The cars are completely new tooling. The car bodies are made of plastic, finely detailed and imprinted, prototypically lettered. The brake handles are separately applied. The cars have type Y 25 trucks with close couplers. Total length over the buffers approximately 252 mm / 9-15/16'. Prototype: 3 German Railroad, Inc. (DB AG) type Eanos-x 052 four-axle gondolas with type Y 25 trucks and type ORE brake handles with protective brackets.